One of the most exciting parts of getting ready for your baby’s arrival is setting up their nursery. Some people opt to use a Pack and Play as a crib at first because they are more compact, generally cheaper, and easier to move if necessary. 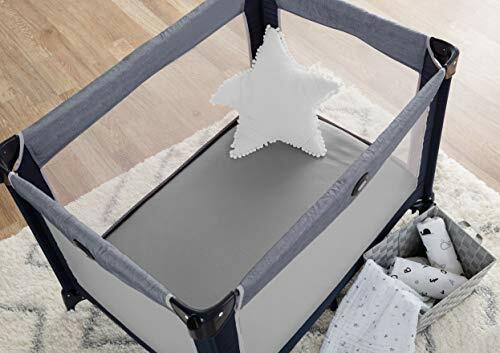 Even if you don’t use a Pack and Play as your baby’s crib at first, you may find yourself using one downstairs for naps, or for a crib when traveling. When it comes to Pack and Plays, you will need to find different sheets than your crib sheets, as standard baby/toddler mattress sheets will be too big for a pack and play mattress. 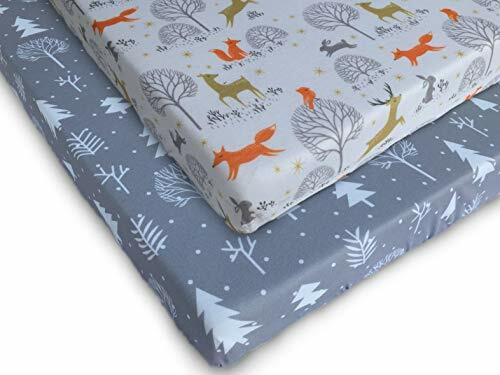 As with all baby products, there are many things you might want to consider before purchasing your pack and play sheets: pattern, softness, mattress protection, and so on. 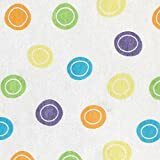 My top pick for pack and play sheets are the American Baby Company’s playard sheets. They have the elastic corners to keep the sheet in place, and they are stretchable to fit some of the less common pack and plays. To top everything off, they are amazingly soft. I am a huge fan of jersey sheets – they are what I use on my bed, so I was eager to find them for my son as well. They are just so cozy! And they are also on the cheaper side. They are not the cheapest available, but they are definitely fairly priced. 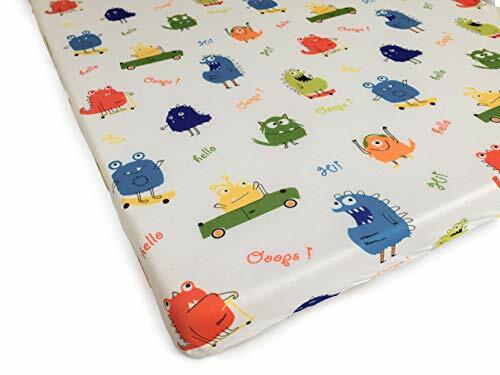 These American Baby Company sheets are fairly thin, and do not come in fun patterns. 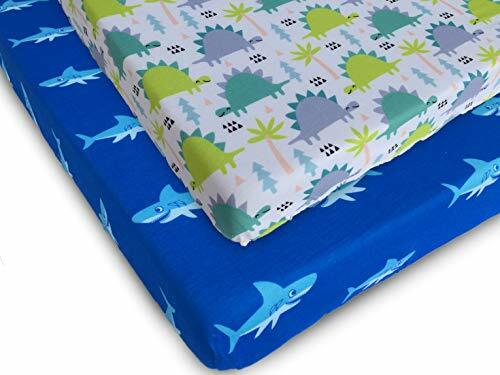 But if you are looking for a sheet to use for your pack and play that you use infrequently, these are a best bet in my book. Other features more important to you? Continue on to see my bests based on other metrics! My overall pick for best pack and play sheet wins this category. 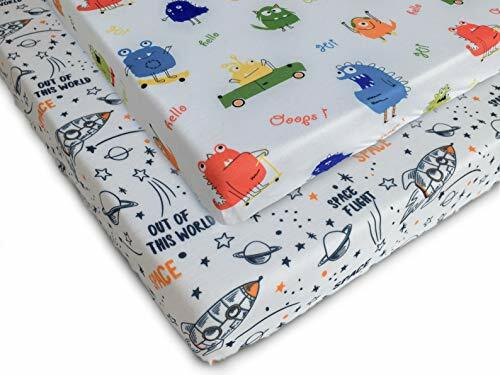 The American Baby Company Playard sheets are stretchy enough to fit most pack and plays, without being too stretchy that they are loose on smaller pack and play mattresses. Please note that the bigger your pack and play mattress is, the more the sheet will have to stretch, and it does become a bit see through because these sheets are on the thin side. You really don’t see many fun patterned sheets for pack and plays. Most patterns on other sheets are pretty mild or plain in color, so if you are looking for something a bit more wild, check these out! 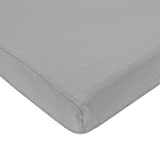 The Graco Pack ‘n Play Playard sheets are one of the only brands of sheets that I’ve run into that do not have elastic around the corners to hold the sheet in place. Instead, the fabric just wraps around the mattress, and each corner of the sheet has a sort of pocket for the corner of the mattress. I have tried these sheets and felt like they were not snug enough. You really have to tuck in all of the sides to make sure there is no loose fabric, and I found myself having to readjust them every few days. It is definitely doable – I used them fairly frequently despite the lack of elastic. However, I much preferred my pack and play sheets that did have the elastic corners. One thing that I do like about the Graco sheets is that you can get a quilted version of them. The quilted version adds some cushion to make the mattress a little more comfy for your baby. They also add a bit of warmth, and are great for winter months. There are two brands of sheets that win this category. 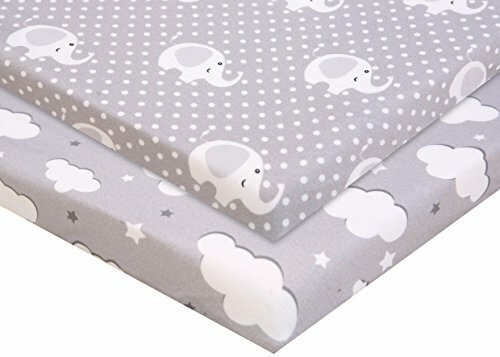 The first is my top pick again – the American Baby Company sheets. I love that they are jersey-style sheets because they are my personal favorite for myself. The second is Mom’s Besty sheets. They are also made of jersey cotton, leaving them super soft as well. Unfortunately, they are a little tight on some pack and plays, including the Graco Pack ‘n Play. Mom’s Besty encourages measuring your Pack and Play mattress before ordering, stating their sheets fit mattresses up to 24″ x 38″ x 4″. 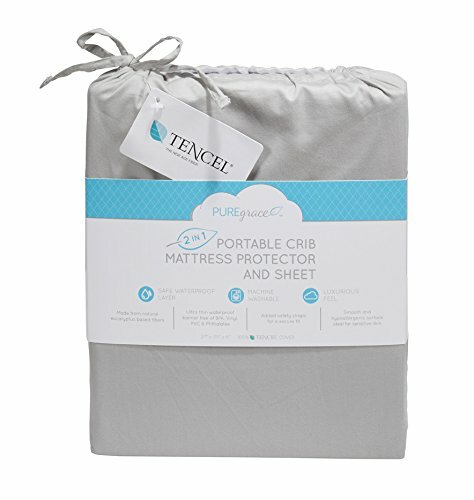 The PUREgrace pack and play sheets are a mattress protector and sheet in one. 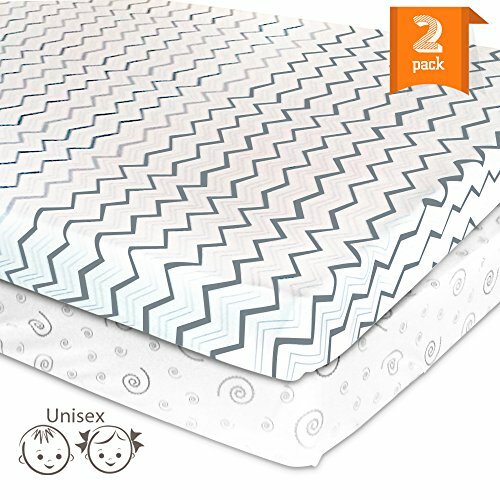 They provide the protection you need to keep the pack and play mattress clean by lining the sheet with a waterproof mattress protector. They are still super soft, as the protective layer is underneath the overlaying sheet. So you know how I keep raving about the American Baby Company sheets? Here’s one more reason: they are usually the cheapest. But we all know that prices can fluctuate, and for the sake of giving you some variety, I’ll talk about the Luvable Friends fitted playard sheet. This brand is the often cheapest you can find when it comes to pack and play sheets, and it’s realy comparable to the price of the American Baby Company ones. They come in a single pack for a reasonable price. You can choose from 3 polka dot designs- one with girly colors, one with masculine colors, and one with neutral bright colors. They are 100% knit cotton,and they’re surprisingly soft considering the price point. One thing to note here is that these are designed to cover the mattresses that you place in pack n plays, not the cardboard support that comes with the pack n play. Many pack and play mattresses are the same size, but some are slightly different. It is important to find sheets that fit snugly, but not too snug. With a variety of pack and plays out there, be sure to check your mattress size and compare it to the dimension of the sheets. If your sheets are too small, your pack and play mattress may end up bunching up like an accordion. If they are too big, they will be too loose which isn’t safe for your little one. 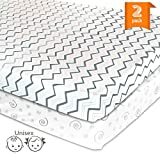 With this, be sure to pay attention to whether the sheets are designed to cover the thin, wooden pack and play support mattress (usually included with the whole pack and play and still called a mattress for some reason), or the few-inch-thick mattresses that you can buy separately for use in a pack and play. I used a pack and play for my son for the first year of his life. One thing I found was that there weren’t many pack and play sheet brands with fun designs or patterns! 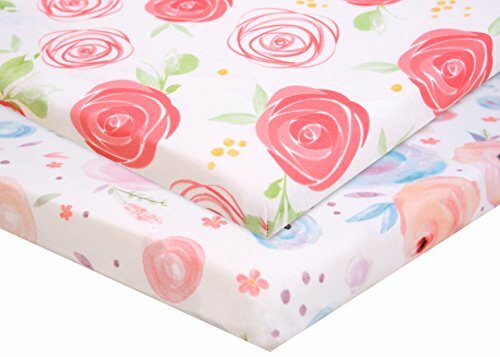 Unfortunately, there isn’t as wide of a selection for pack and play sheets as there are for regular crib mattress sheets. But if you shop around, you can find some cute patterns! Or at least a color that fits your taste. Surprisingly, not all pack and play sheets have elastic at the corners (like a fitted sheet does). Although the elastic isn’t necessary, it does help to keep the sheet in place. Without the elastic corners, you may find yourself needing to readjust the sheet often. Just like adult sheets, baby sheets come in a variety of thread counts and fabrics, leaving some more soft than others. We all want our little ones to be as cozy as possible! Oh how important this one is. Pack and play mattresses can generally be wiped clean fairly easily. However, there are certain messes where you may want an extra layer of protection. I learned this the hard way when my son had his first stomach bug. I didn’t have a mattress protector on his pack and play and ended up spending hours cleaning his mattress thoroughly enough! In my opinion, Pack and Play sheets are a little more costly than they should be. Especially considering they don’t come in a variety of fun patterns. Generally speaking, they typically are around $8-$20 a sheet, with most being around the $12-$15 range. Obviously, this isn’t going to break your bank account, but considering you will probably need at least two sheets (to have one as a backup), if you are on a budget, this can easily become an annoying extra cost. Overall, I recommend the American Baby Company pack and play sheets because of their softness and ability to fit most mattresses snugly. Unfortunately, they don’t come in fun patterns, but then again, you won’t find too many fun pack and play sheet patterns out there. They also do not serve as a mattress protector, so you would have to buy one separately if you wanted to add an extra layer of protection. Depending on what is most important to you, there are a variety of pack and play sheets to choose from! Typically the more features you want, the more expensive the sheet is going to be, but you can find some bargains out there.